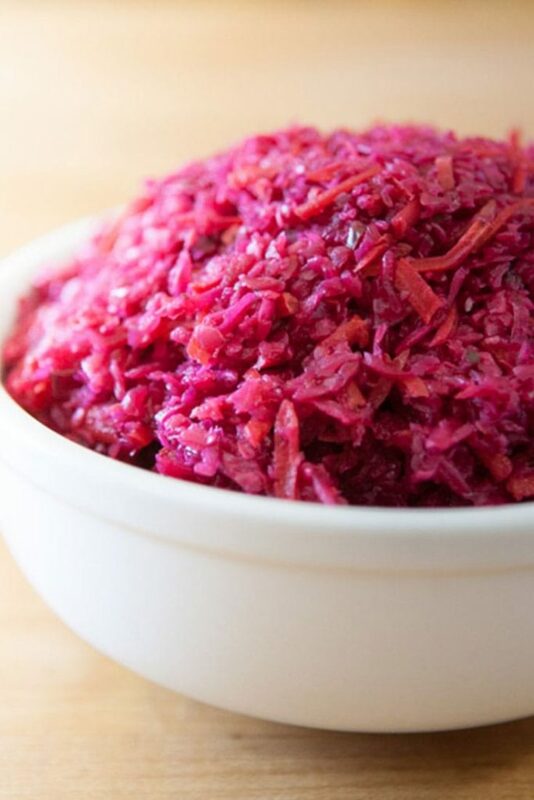 Please note that when making slaw-slyle ferments, it is especially helpful to use a fermenting crock or airlock as the small pieces naturally want to float to the surface, making for a greater chance of surface mold. I’ve made this a few times now and one time while using the jar-in-a-jar technique (which I depict below) I ended up with mold and had to discard. I’ve since committed to making this in a fermenting crock to consistently more positive results. Making this using an airlock such as in this kit from MasonTops is definitely advised. 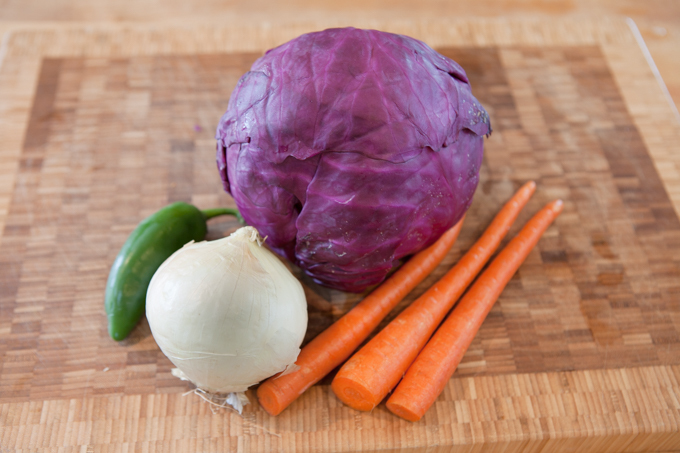 Prepare vegetables - shred the cabbage, onion and carrots and place in a large bowl. Dice the jalapeño and add to bowl. 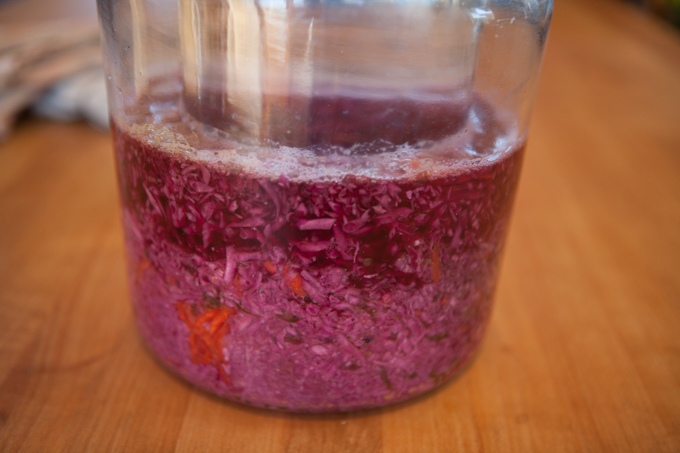 Place all ingredients in a fermentation vessel - you can use a fermenting crock, or perhaps a 1 gallon Anchor Hocking Jar. Don't forget to include any liquid that may have leached from the veggies. Compress - Use your fist to compress the mix into the bottom of the vessel, encouraging the level of the liquid to rise. I love these Pickle Packers which make compressing veggies much easier. Place a weight directly on top of the mix - the point of this is to further the extraction of liquid from the veggies. 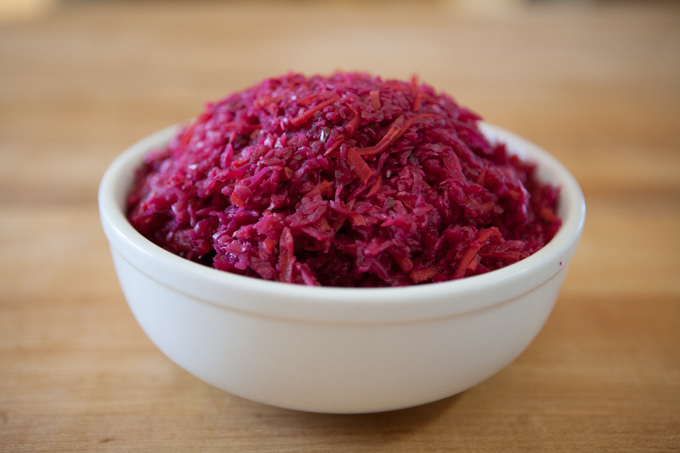 Allow to ferment 3-5 days - This ferments fairly quickly to the point where the flavor is delicious in a relatively short time. You can of course ferment it longer and it will simply grow more sour Should you decide to allow it to ferment longer (up to several weeks) , it will continue to grow more sour. Serve it as a simple side salad, as a healthy topping to football game nachos, or a garnish along with traditional pupusas. I like to put it (or any sort of fermented cabbage dish really) as a topping to dosas. I also posted a recipe for mixing this curtido with diced kale in making a delicious salad. You can check that recipe out here. Thanks for the recipe Ted. The Purple Fermented Cortido turned out great! You said to “jar it up”. 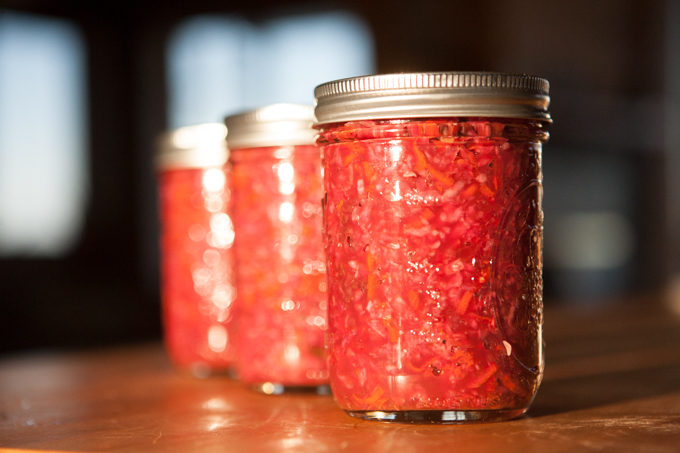 Do you add the liquid to the jars? I think you must. Thanks for your question Kathryn. Yes, definitely add the liquid to the jar when you “jar it up.” Hope you like it! I made this a second time and, not sure why but first time was really good but second time really scrumptious. By the third day, it was foaming like the head on a beer! Thanks for the recipe! 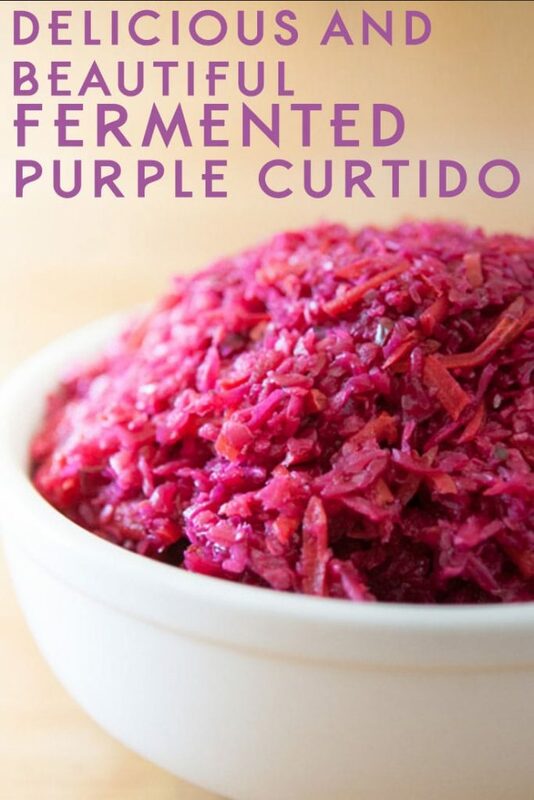 I know, I love when a ferment gets extra active like your purple curtido. I just had some of that from a previous batch last night with dinner!